- A unique, digital-first learning solution, that is consistently updated with refreshed content to provide students the most relevant computer concepts and digital literacy information. - Each lesson provides a structured, consistent step-by-step framework including a lesson overview, skills preview, and project practice. 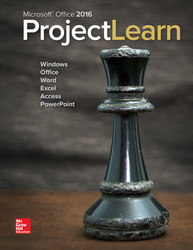 - Each chapter has two "on your own" projects that each have three "work it out" exercises. Within the project experience, students develop a deeper understanding of skills essential to their future careers.